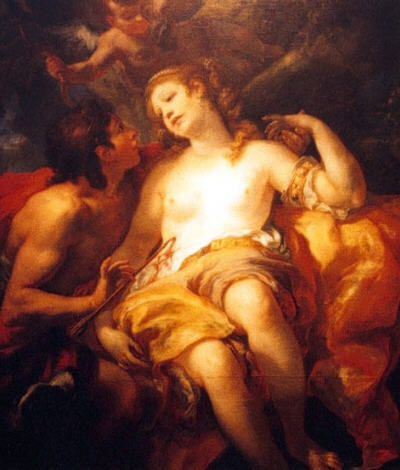 Cephalus was fine hunter and a handsome youth who attracted the attention of Eos, the goddess of the dawn. Eos had a weakness for handsome young men and early one morning as Cephalus was tracking deer, the lustful goddess decided to whisk him away in her chariot. But Cephalus was very much in love with his new wife Procris and showed not one bit of interest in the goddess. Finally, after growing tired of his rejection, Eos released him and sent him home to his wife. Before letting him go, she made sure she planted a seed of suspicion in his mind by suggesting that possibly his bride had not remained true to him during his absence. This thought drove Cephalus so mad with jealousy that before returning to his homeland he disguised himself so well that not one in his neighbors recognized him. When Cephalus arrived home he found Procris to be in a very melancholy state of mind. So dismal was she that had it not have been for the mocking words of Eos the he would have immediately called off the test. Instead he chose to remain in the guise of a stranger all the while trying his best to make his unsuspecting wife fall in love with him. He constantly told the gloomy maid that it was he who loved her not her wandering husband who chose to leave her saddened and alone. But his words had no effect on her, as Procris continued to proclaim her love for only Cephalus. It came to pass that one day during Cephalus' usual persuasive speech, Procris did not voice her love for her husband as loudly as the day before. Irate, Cephalus ripped off his disguise to reveal his true idenity. Procris stood shocked as she listened to her husband's accusations. Cephalus called her a shameless woman and accused her of being unfaithful to him. When he was finished Procris turned and left the house. Filled with feelings of disgust for all men she headed towards the mountains where she intended to live out the rest of her life alone. The guilt ridden Cephalus searched the mountainous caverns for his wife and upon finding her begged her forgiveness. After some time Procris found it in her heart to reunite with her husband and the couple spent some years together before their union came to a tragic end. It seems that Procris was a favorite of the goddess Artemis, who had given to her as gifts a dog named Lelaps and a magic javelin. The hound was so swift on its feet he easily could outrun any opponent while the javelin was made to mever miss its mark. Procris in turn gave these gifts to her husband because she loved him very much and knew how much he enjoyed hunting. It came to be that a ravenous fox was causing much havoc by tearing up the countryside and it was soon decided that he must be captured and destroyed. The hunters did their best but the creature was very fast and no one was able to keep up with him. Knowing that Lelaps was incredibly quick, the hunting party paid a visit to Cephalus in hopes of borrowing the services of his famous dog. Cephalus was happy to help and immediately let Lelaps loose to track the fox. No sooner then he reached the edge of the woods, the eagar hound raced off in pursuit of his catch. As Cephalus and the group of hunters watched from a hilltop, Lelaps closed in on the fox. He snapped at his heels but each time his jaws closed the relentless hound only came away with a mouthful of air. Cephalus raised his javelin but before he could release it all movement between the dog and his prey came to a halt. To the surprise of all the onliikers, both were frozen in their places as if they had been turned into stone. Though Cephalus had lost his faithful dog to the will of the gods, the young man still took great pleasure in the art of hunting. He often went out early in the morning, traveling alone except for the company of his trusty javelin. It came to be that one day after a particulrly tiring hunt, Cephalus removed his garments and stretched himself out under a group of shady trees to rest. He called upon the sweet breeze to caress his breast, but little did he know he was not alone. 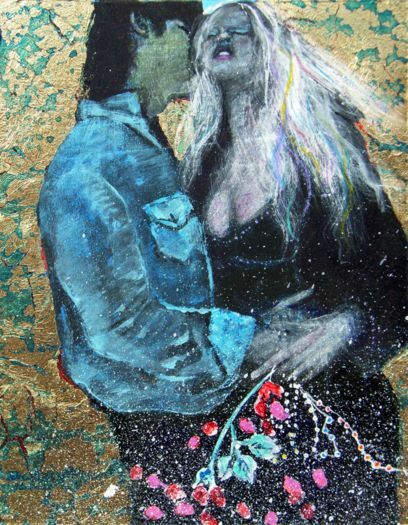 For a passer-by overheard his words and thinking he was whispering to a maiden ran and told Procris her husband was unfaithful. This came as a great shock to Procris and her heart at once filled with grief. After a few moments she resolved that before she could believe such a thing about Cephalus she would have to see it for herself. With much anxiety she waited until morning, when Cephalus left on his usual hunting trip to the woods. Procris secretly followed after her unsuspecting husband and hid herself in a thicket near where Cephalus was known to take his afternoon rests. He arrived to his usual quiet spot and just as he did on previous days called a greeting to the breeze and asked that she come and caress him. As he spoke his endearments to the soft wind he thought what sounded to be a sob coming from a near-by bush. Thinking it was some animal, Cephalus drew his javelin and let it fly into the brush. Hearing a gasp Cephalus parted the bushes to find once again his magic spear had hit its target. To his horror he saw no animal, but instead found his lovely bride pierced through the heart by his spear. Cephalus lifted her up and tried to stop the wound from bleeding. He begged and pleaded for her not to leave him, but Procris could only open her eyes and whisper "Please my husband, if you have ever loved me, even if for just one day, do not marry that hateful Breeze!" Now it became clear to Cephalus what had happened but it was too late to explain. 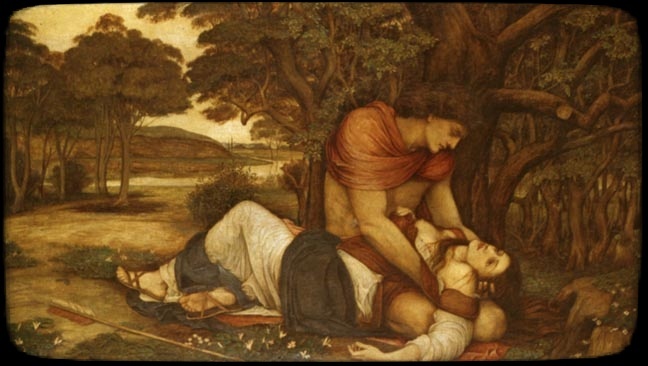 Procris quietly died in the arms of the man she loved.